To look upon the Islamic Republic through America’s lense borders the irrational if we consider that America’s ire is based purely on Iran’s willingness to exist beyond US control in a world dominated and marked by US hegemonism. US Secretary of State Mike Pompeo’s inferred claims that Iran remains a threat to the ‘Free World’ exist I’m sorry to say in a vacuum. America’s stance on Iran is no more logical than it is warranted, especially now that the White House is openly plotting regime change – in contradiction with international law. Iran “is run by something that resembles the mafia more than a government,” Pompeo said, citing what he called Iranian leaders’ vast wealth and corruption. Pompeo’s speech was the latest step in a communications offensive launched by the Trump administration that is meant to foment unrest in Iran, US officials familiar with the matter told the press this August. 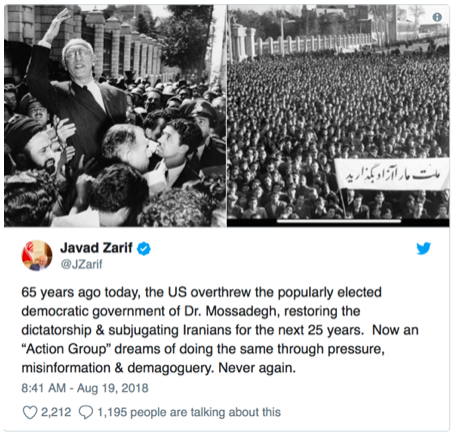 If Americans feel entitled to their outrage following allegations of Russian meddling during 2016 presidential elections, it stands to reason that Iranians would too, feel resentment towards Washington for its self-confessed coup d’etat against Prime Minister Mohammed Mossadegh back in 1953. This coup d’etat allowed for the Shah to consolidate power and thus render Iran’s budding democracy null and void. And yes 1953 may feel like a long time ago if not for the millions of lives which were ultimately sold out to absolutism. Iran was robbed of its sovereignty and right to political self-determination to secure Britain’s oil monopoly in the region by the one power whose birthright was forged in the rejection of Britain’s imperialism. How is that for historical irony? It was US President Dwight Eisenhower’s decision to support Britain against Iran’s rising nationalist movement that ultimately ruined what had been political kinship. Where US President Harry Truman had been sympathetic to Iran’s rising nationalism and democratic undertones, his successor, President Dwight Eisenhower considered any government opposed to western interest aka corporations’ access to natural resources, an enemy to be crushed – hence Washington’s support of a Britain in running Iran’s democracy to the ground. And yet, once upon a time … not too long ago America and Iran shared in their dreams of freedom, democracy, and territorial sovereignty. Once upon a time, back when the United States had not yet betrayed its position to neo-imperialism, Washington sat still the model Iranian ambitioned to emulate to free themselves of Britain’s colonial grasp. Unknown to most Iran still holds two men, two Americans for their unrelenting support of Iran’s sovereign claim against both colonialism and communism: Howard Baskerville and Morgan Shuster. It is not so much that Iran hates the United States but rather that it blames US officials for interrupting its political and institutional independence – thus forcing millions to live at the mercy of a violent and reactionary autocrat. While the Shah may have been the darling of many western capitals, his proclivity to torture, imprison and exile all who voiced any criticism to his absolute rule sits him firmly among the most violent and despised criminals our century has so far come across. He was, let us all remember, a favourite of the US Establishment, yet another ‘friendly’ autocrat America was keen to hail a strategic ally, even if in contradiction of the very democratic principles it says to represent. History, readers will find, does not speak highly of the ‘American model’ since it stole Iran’s democratic dream to assert the rule of a tyrant: the Shah. Today the Trump’s administration is working relentlessly towards the promotion of a regime change so that once again, Iran’s sovereignty would be disappeared to capitalists’ hunger. Let’s not pretend that America’s interests in toppling Tehran’s government are not financially self-serving. With vast reserves of oil and gas, and a land that stretches thousands of miles at a key geostrategic chokepoint, Iran is a jewel among all jewels – even more so than its neighbour: the Kingdom of Saudi Arabia. So what if America does not agree with Iran’s system of governance? So what if it looks upon Iran’s clergy with disdain for its speaks of values foreign to its own conceptualisation of power? Are we to understand that America’s political alliances are a reflection of its deepest socio-political thoughts? What is there to say then of America’s love affair with Saudi Arabia and other totalitarian regimes? 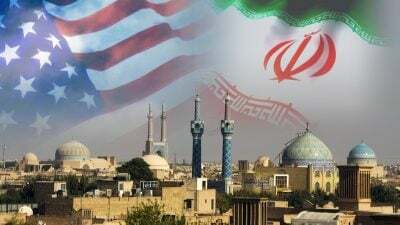 Washington’s war games in Iran are not to be taken lightly since they entail the negation of a nation’s right to its political future. Can we in all good conscience deny Iran the political freedom we claim for ourselves? Is the right to resist oppression tethered to geography and our own sense of western entitlement or is it a natural right all nations are to exercise freely? Earlier this August Secretary of State Mike Pompeo unveiled his plan to coordinate the Trump administration’s post-nuclear deal approach to Iran and bolster support for the strategy abroad. ‘The Iran Action Group’, as it has been branded, will be helmed by Brian Hook, the secretary of state’s senior policy adviser, who will receive the title of special representative for Iran. Pompeo told reporters that the coalition is charged with “directing, reviewing and coordinating all aspects of the State Department’s Iran-related activity” and will report directly to him. In the face of such hyper-exceptionalism it is nations’ right to political self-determination we are ultimately sacrificing. Professor Jordan Peterson once said that to “think is to take the risk of offending others” … I would add that to exercise one’s democratic right is to be willing to resist political oppression. America’s move of late to cosy up to Iran’s ‘opposition’ groups so that it could bolster a political alliance petitioning for change risks ushering yet another era of political oppression. Should the likes of the MEK – a well-known terror group now sold as palatable to serve Washington’s immediate political interests , or Iranian monarchists be offered the time of day, we stand to unleash forces which will ultimately sow discord, instability, and violence. Akhilesh Pillalamarri’s claim in The Diplomat that Iran’s monarchy could ‘save Iran as it once did’ is as dishonest as it is ludicrous. Iran’s monarchical past was as painful as it was bloody … to argue otherwise is to deny Iranians the democracy they so valiantly bled for. And while many may still object, Iran’s future belongs to Iranians.